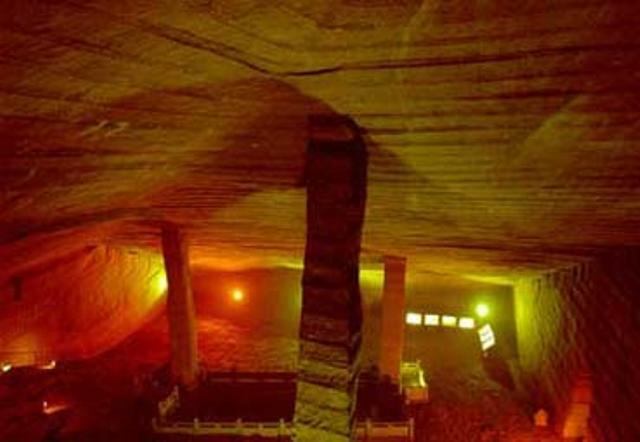 The Longyou Caves are located in Shiyan Beicun on the Qiantang River. The 24 man-made Caverns have a total volume of at least half a million cubic meter. They may be considered as a monument for the worldwide Comet Catastrophe (or Flood) in the Sixth Dynasty of Egypt during the reign of the 1st king Teti. The Site shows the original world population was 4.8 million men, but 2.6 million perished (54%), and 2.2 million people survived. There was a precipitation of 9 meters of water during 2 + 2 = 4 months. It ended all ancient civilizations on Earth. However, in the first place the Caves were constructed as a subterranean palace for the King and the Royal Court for their necessary protection during the return of this Comet. The Longyou Caves were probably built when this happened, c.1200 BC. Zhejiang, formerly romanized as Chekiang or Che-Keang, is an eastern coastal province of the People's Republic of China. The word Zhejiang means zigzagging river and was the old name of the Qiantang River, which passes through Hangzhou, the provincial capital. In 1992 Caves were discovered along this river in Longyou County, Quzhou prefecture. This county has a diameter of c.40 km, and about 400 thousand inhabitants. The Longyou Caves are located at Phoenix Hill near the village of Shiyan Beicun on the northern bank of this river. They were discovered by pumping out water from deep ponds. Previously these ponds were believed to be natural, but the Caverns below their surface turned out to be artificial. They were clearly man-made, completely carved out of the siltstone bedrock! The Phaistos Disc of Crete (Greece) dates from 1458 BC. It reports that the 3rd king Djer (c.3043-3012 BC) and the 4th king Djet (c.3035-3012 BC) of the First Dynasty of Egypt discovered the coasts around the South Chinese Sea. These coasts include the South Coast of China from Taiwan to Vietnam, as well as the island of Hainan. The height of the horizontal bands seems to be c.600 mm (Fig.4). In antiquity geographic distances were expressed in moiras (1 moira= 1o of latitude= 111 km). So, this height of 600 mm = 600/111 = 5.4 micromoiras. This is a number between 5 and 6, which appears to refer to the dramatic events between the Fifth and the Sixth Dynasties of Egypt. A huge Comet Catastrophe (or Flood) occurred, which would lead to the end of the Old Kingdom. 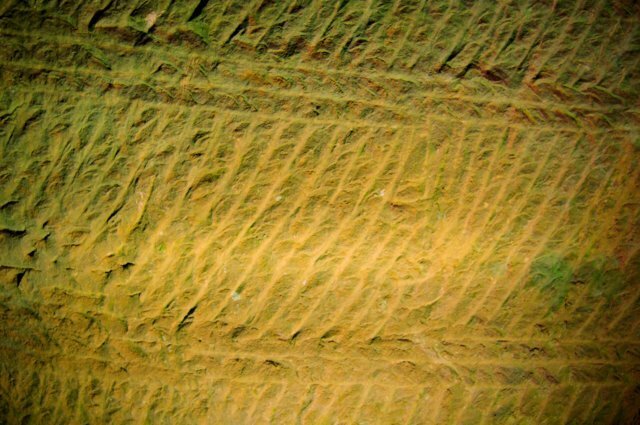 The carved, vertical strokes in the bands appear to make an angle of 60o with the horizontal lines (Fig.4). They refer to the start of the Sixth Dynasty, the last one of the Old Kingdom. It confirms the worldwide Comet Catastrophe in c.2344 BC, just mentioned (tree-ring dating). The length/width ratio of the strokes equals 10, possibly referring to the 1st king Teti of this dynasty, when it happened. The Longyou Caves are located at a latitude of 29oN, which is 29o - 23o = 6o above the holy Tropic of Cancer (Sun religion). [On midsummer day the Sun is at right angles above. The slow northerly movement of the Sun turns into a southerly movement. So, people believe in the SunGod Ra.] It refers to the Sixth Dynasty, the last one of the Old Kingdom. Its complementary latitude of 90o - 29o = 61oN refers to the 1st king Teti (c.2370-2338 BC) of this Dynasty (60+1). In antiquity the use of complementary latitudes was very common. The Comet Catastrophe of c.2344 BC happened during his reign. The Qiantang River flows to the Bay of Hangzhou, at 30oN. Its complementary latitude of 90o - 30o = 60oN refers to the Sixth Dynasty when the Comet Catastrophe occurred. This Bay is located 30o - 29o = 1o above the Longyou Caves, confirming the 1st king Teti when it happened. The meridian, or North-South line of the Site runs along the Bay of Haizhou, Jiangsu, 35o - 29o = 6o above the Longyou Caves, confirming the Sixth Dynasty. This Bay is located 36o - 35o = 1o below the capital of Anyang, Henan, at the level of the Bay of Quingdao, Shandong, confirming the 1st king Teti when it happened. The meridian leaves the Bay of Laizhou, Shandong, 37o - 36o = 1o above the capital of Anyang, Henan, confirming the 1st king Teti when it happened. It crosses the Luan He River, Tangshan Area, 40o + 20o = 60o above the north coast of Australia, at 20oS, confirming the Sixth Dynasty. Penglai, the North Cape of Shandong Peninsula, at 38oN, is located 38o - 32o = 6o above the important Chang Jiang River, at 32oN, confirming the Sixth Dynasty. The south cape of Dalian Peninsula, at 39oN, is located 39o - 38o = 1o above it, confirming the 1st king Teti when it happened. The Longyou Caves are located at a latitude of 29oN. It encodes the 29 days of a month. The carved, vertical strokes in the bands make an angle of 60o with the horizontal lines (Fig.4). So, the planet Earth was inside the Tail of the Comet for 60 days, or two months. The falling rocks caused huge forest fires, and the melting ice of the Comet caused torrential rains. There were huge foodings everywhere. It was completely dark on Earth. This period was probably the worst. Below the bands are two horizontal lines. So, it was a two-stage-event. After the first stage the planet Earth left the Tail of the Comet, but the second stage also lasted for 60 days, or two months. The whole climate on Earth was completely disrupted. The torrential rains continued, but it also became bitterly cold. So, these rains were changing in ferocious snow and hail storms. The huge floodings continued, and many people died from starvation. The height of the vertical strokes equals four times the height of the two horizontal lines (Fig.4). It confirms the whole Disaster lasted for 2 + 2 = 4 months. The vertical pillars in Figs.2 & 3 have square cross sections, with four equal sides and angles, confirming it, again. The Qiantang River flows to the Bay of Hangzhou, at 30oN. It confirms the 30 days of the month. Its complementary latitude of 90o - 30o = 60oN confirms the duration of each stage, 60 days, or two months. The meridian, or North-South line of the Site runs to the Lena River, Russia, at 60oN, confirming it. The Caves are located at a distance of 222 km = 2 moiras from the East Coast of China at this latitude. It confirms the Comet Catastrophe was a two-stage-event, with each stage lasting two months. Shanghai Peninsula is located 31o - 29o = 2o higher, confirming it. The meridian of the Site leaves the SE Coast of Fujian, Strait of Formosa, at the level of the north coast of Taiwan, 29o - 25o = 4o below the Caves, confirming the 4 months duration of the Calamity. It runs to the Argun River on the border of Mongolia and Russia, 50o - 10o = 40o above Palawan Island, Philippines, confirming it. This long island has the shape of a Comet! The complementary latitude of the Argun River, at 90o - 50o = 40oN, confirms it, again. The Qiantang River flows to the Bay of Hangzhou, at 30oN. The holy Tropic of Cancer, at 23oN, is 30o - 23o = 7o to the south. So, before the Comet Catastrophe there were millions of people on Earth (a number of 7 figures). The meridian of the Site leaves the SE Coast of Fujian, at 25oN, which is 73o - 25o = 48o below the Bay of the Olenëk River, Laptev Sea, Russia, encoding a world population before the Flood of 4.8 million men. It is the north coast of the continent, at 73oN. The SE Coast of Fujian is located 32o - 25o = 7o below the important Chang Jiang River, suggesting millions of casualties (a number of 7 figures). 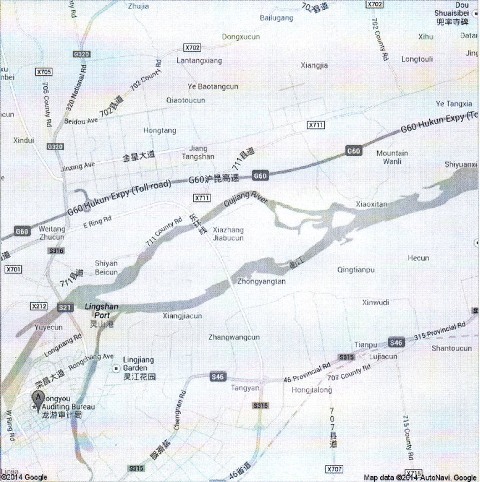 The meridian runs to the Min Jiang River near Fuzhou, Fujian, at 26oN, encoding 2.6 million casualties (54%). It is the important latitude of the “Valley of the Kings”, at the “Knee” of the River Nile, Egypt. It is located 26o - 25o = 1o higher than the SE Coast of Fujian, referring to the 1st king Teti, when it happened. The holy Arctic Circle, at 67oN is 67o - 60o = 7o above the Lena River, Russia, confirming the millions of victims (a number of 7 figures). It is the northernmost line the Sun still shines at midwinter day (Sun religion). The meridian crosses the Viljuj River, Russia, at 63.5oN. When rounded off to 63oN, it is located 63o - 37o = 26o above the Bay of Laizhou, Shandong, at 37oN, confirming the 2.6 million victims. When rounded off to 64oN, its complementary latitude of 90o - 64o = 26oN confirms this number. It is located 64o - 10o = 54o above Palawan Island, Philippines, confirming the percentage of victims, 54%. The capital of Anyang, Henan, and the Bay of Quingdao, Shandong, are located 36o - 29o = 7o above the Longyou Caves, confirming the millions of casualties (a number of 7 figures). These places are 36o - 10o = 26o above Palawan Island, Philippines, at 10oN, confirming the 2.6 million casualties of the Flood. This island has the shape of a Comet! Anyang and Quingdao are located at 36oN. It symbolizes the circumference of the planet Earth of 36 Moiras, or 360o. It shows the Comet Catastrophe of the Sixth Dynasty was a worldwide Disaster. The complementary latitude of 90o - 36o = 54oN confirms the percentage of casualties, 54%. The meridian of the Site runs to the Chang Jiang River, 32o - 25o = 7o above the SE Coast of Fujian, Strait of Formosa, confirming the millions of survivors of the Flood (a number of 7 figures). This important River is located 32o - 10o = 22o above Palawan Island, Philippines, confirming the 4.8 - 2.6 = 2.2 million survivors. Most of them were seriously injured. The South Cape of Taiwan, at 22oN, is located 29o - 22o = 7o below the Longyou Caves, again confirming the 2.2 million survivors (a number of 7 figures). It is located 22o - 10o = 12o above Palawan Island, Philippines, with the shape of a Comet, confirming the 120 days duration of the Flood of the Sixth Dynasty. PrecipitationThe meridian of the Longyou Caves runs 8o to the north, to the Bay of Laizhou, at the level of the East Cape of Shandong Peninsula, at 29o + 8o = 37oN. It encodes the total precipitation during the Flood, about 80 micromoiras = 8.8 or 9 meters of water. The same meridian runs to Palawan Island, Philippines, with the shape of a Comet. Its latitude, at 10oN, refers to the 1st king Teti when the Disaster happened. Its complementary latitude of 90o - 10o = 80oN confirms the precipitation. The south cape of Hainan Island, at 18oN, is situated 18o - 10o = 8o above it, confirming it, again. The Longyou Caves are located on Phoenix Hill in groups of eight Caves, confirming it. The height of the strokes in the horizontal bands (Fig.4) equals 2 x 4 = 8 times the width of each stroke, confirming it, again. So, the total precipitation during the Biblical Flood was 9 meters of water on the entire surface of the planet Earth (c.2344 BC). It corresponds to an ice ball with a volume of 5.106 km3, having a diameter of 200 km (or 130 miles). This dirty ice ball, with stones, ended all ancient civilizations on Earth. Fig.5 Shiyan Beicun at the western end of the island of Xiazhang Jiabucun. This island has the shape of a Comet! The Longyou Caves are located at 29oN, which is 29o - 23o = 6o above the holy Tropic of Cancer (Sun religion). It refers to the Sixth Dynasty, but also to the approximate periodicity of the Comet: c.600 years. The vertical strokes in the wall decoration make an angle of 60o, confirming it. Together with the two lines at the bottom these form 2 + 1 = 3 units, referring to a number of 3 figures. The three groups of Caves at Phoenix Hill confirm it. The meridian of the Site runs over 32o - 29o = 3o of latitude to the north to the wide Chang Jiang River, at 32oN. Its complementary latitude of 90o - 32o = 58oN encodes the exact periodicity of the Comet: 580 years (a number of 3 figures). - It runs to the Viljuj River, Russia, another 64o - 32o = 32o to the north, confirming it. The Bay of Haizhou, Jiangsu, is located 67o - 35o = 32o below the holy Arctic Circle, referring to the importance of the Chang Jiang River at this latitude (32oN). Penglai, the North Cape of Shandong Peninsula, is located 70o - 38o = 32o below the Olenëk River, Russia, confirming it. This difference in latitude of c.30o confirms a periodicity with a number of 3 figures. It also refers to a much colder climate in the World during more than three centuries, from c.2344 BC to c.2000 BC, which is at the start of the Twelfth Dynasty (Middle Kingdom). In antiquity geography was much more important than nowadays. So, the story about the Comet Catastrophe of the Sixth Dynasty might also be told in terms of differences in longitude. In Egypt these were used from the start of the First Dynasty. 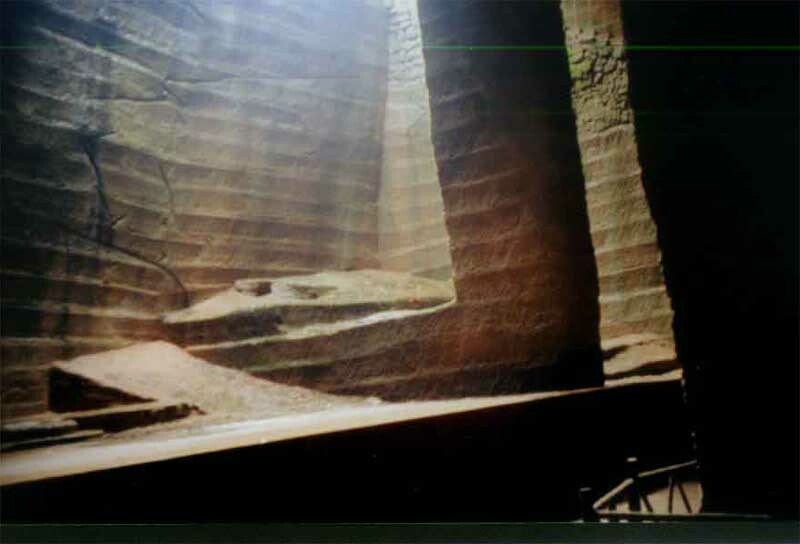 The Longyou Caves are located at a latitude of 29oN and a longitude of 119oE. The east shore of the Lake of Dongting, Hunan, is located 6o to the west, encoding the Sixth Dynasty, when the Comet Catastrophe occurred. The opposite shore is another degree to the west, which shows it happened during the reign of the 1st king Teti. This west shore is located 6o + 1o = 7o to the west, which shows there were millions of casualties (a number of 7 figures). The confluence of the Panjnat and Indus Rivers in Pakistan is located 48o to the west, encoding an original world population of 4.8 million men. The south shore of Lake of Hamun-i-Lora, Pakistan, is located 54o to the west, encoding the percentage of casualties: 54%. So, there were (54/100)x4.8 = 2.6 million victims. The Persian Gulf is located 70o to the west, which confirms there were millions of victims (a number of 7 figures). – The Yamuna River, India, is located 22o west of the Jinsha Jiang River, on the border of Sichuan and Tibet, confirming the 4.8 - 2.6 = 2.2 million survivors. Most of them were seriously wounded. It shows that people who were high in the mountains survived. The west shore of Lake of Poyang, Jiangxi, is located 3o west of the Longyou Caves, encoding the 30 days of the month. The Jinsha Jiang River, on the border of Sichuan and Tibet, is located 20o to the west, which shows the Comet Catastrophe was a two-stage-event, with each stage lasting 2 months. The Jinsha Jiang River is located 2° west of the Yalong Jiang River, Sichuan, confirming it. This last River is located 11o west of the west shore of Lake of Dongting, Hunan, which illustrates the real duration of the Flood was 110 days, slightly less than previously suggested. 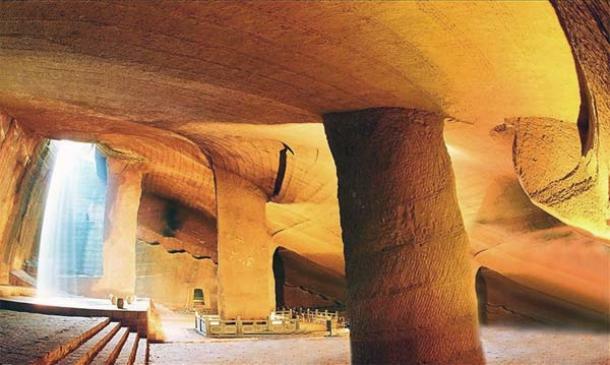 The Longyou Caves are a monument for the Comet Catastrophe (or Flood) of the Sixth Dynasty. However, in the first place they were constructed as a Subterranean Palace for the King and the Royal Court for their necessary protection during the return of this Comet. It is considered proven this Comet was the cause of the end of the Old Kingdom. However, it is very likely the same Comet (or Comet Swarm) was also the reason for the fall of the Middle Kingdom and the New Kingdom! 8. De Jonge, R.M., “Stonehenge, Monument for the Discovery of America (Salisbury Plain, South England, c.2000 BC) (2011), Refs.5,6. 9. De Jonge, R.M., “Tripod Rock, Pyramid Mountain (Morris County, New Jersey, c.1900 BC)” (2011), Refs.5,6. 10. Peiser, B.J., Palmer, T., Bailey, M.E., Natural Catastrophes during Bronze Age Civilizations, BAR International Series 728, Oxford, 1998 (ISBN 0-86054-916- X). 11. Baillie, M.G.L., “Hints that Cometary Debris played some Role in several Tree-Ring Dated Environmental Downturns in the Bronze Age”, Ref.10, pgs.109-117. 12. Peiser, B.J., “Evidence for a Global Disaster in the Late 3rd Millennium BC”, Ref.10, pgs.117-140. 13. Courty, M.-A., “The Soil Record of an Exceptional Event at 4000 BP in the Middle East”, Ref.10, pgs.93-109. 14. Clube, S.V.M., and Napier, W.M., The Cosmic Serpent, Faber and Faber, London, 1982. 15. Clube, S.V.M., and Napier, W.M., The Cosmic Winter, Blackwell, Oxford, 1990. 16. Joseph, F., Survivors of Atlantis, Their Impact on World Culture, Bear & Co., Vermont, 2004 (ISBN 1-59143-0-040-2). 17. Baillie, M., Exodus to Arthur, Catastrophic Encounters with Comets, BT Batsford Ltd., London, 1999 (ISBN 0-7134-8681-3). 20. De Jonge, R.M., “Discovery of America and the Flood (c.2300 BC, Ita Letra, Villarrica, Paraguay)” (2009), Ref.5. 21. De Jonge, R.M., “The Discovery of Australia and the Flood (The Rainbow Serpent Shelter, Mt. Borradaile, Arnhem Land)” (2010), Ref.5. 22. De Jonge, R.M., “The Ikom Monoliths and the Flood (1200 BC-200 AD, Cross River State, Nigeria)” (2010), Ref.5. 23. De Jonge, R.M., “Great Serpent Mound (c.2300 BC, Adams County, Ohio)” (2010), Ref.5. 24. De Jonge, R.M., “Gold Ring (Grand Canyon, Arizona, c.1450 BC) (2010), Ref.5. 25. De Jonge, R.M., “The Swan Stone (Burrows Cave, near Olney, Illinois)” (2011), Ref.5. 26. De Jonge, R.M., “Sentinel Rock, Vermont (Discovery of America and Biblical Flood, c.1900 BC)” (2011), Refs.5,6. 27. De Jonge, R.M., “The Brandenburg Stone, Comet Catastrophe of 536/540 AD” (560 AD, Battletown, Meade County, Kentucky) (2010), Ref.5. 28. De Jonge, R.M., “About the Brandenburg Stone (560 AD, Battletown, Meade County, Kentucky)”, Ref.5. 29. De Jonge, R.M., “Oil City Glyphs (Pennsylvania, c. 2000 BC)” (2012), Ref.5. 30. De Jonge, R.M., “V-Shaped Glyph (Pennsylvania, c. 2000 BC)” (2012), Ref.5. 31. De Jonge, R.M., “Copper Spear Tip (Crow Wing County, MN, c.1500 BC)” (2013), Ref.5. 32. De Jonge, R.M., “Four Stone Chambers (I) and (II), (Crestone, Colorado, c.1900 BC) (2013), Ref.5. 33. De Jonge, R.M., “Balanced Rock (I) and (II), (Buhl, Twin Falls County, Idaho)” (2013), Ref.5. 34. De Jonge, R.M., “Burial Site of Lord Nefer-Ti-Ru, son of king Khufu, 4th Dynasty (Gosford, NSW, Australia) (2012), Ref.5. 35. Susan English, Website of the Ancient Waterways Society.